Neville High School has been one of the most dominating programs in Louisiana High School football for such a longtime due to great coaching and the many talented players that have gone through the program each and every year. For example, after a dominating defensive force like Rashard Lawrence (LSU) graduates, a team would have trouble trying to find a guy that can replace a big time defensive lineman like Lawrence. Luckily, the Neville Tigers had Phidarian Mathis. Mathis replaced Lawrence with ease like he never left. The Neville defense, this year, was known for their talented secondary that included the likes of Corey Straughter, JaCorion Andrews, Kendrick Marbles, and Herschel Carter, but it was Mathis who did the dirty work on the interior of the defensive line and got the job done against the run while his teammates got the job done in coverage. As a result, the defense was one of the most dominant defenses in all of Louisiana. This season, he had over 50 tackles, five tackles for loss, and seven sacks while being double teamed most of the time. At 6’4, 280, Mathis has the size and versatility to play at defensive tackle and at defensive end. Mathis was part of a team that was looking for 40 straight wins and a third straight championship when they played undefeated Edna Karr. The result didn’t go Neville’s way, but what a career for Phidarian Mathis to be a part of a dominant program like Neville High School. 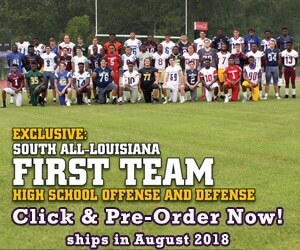 At the beginning of the season, Mathis made our 1st Team All-Louisiana team. Louisiana Football Magazine Editor and T.V. Host Lee Brecheen had this to say about the big time DE/DT prospect from Neville in our annual magazine before the season started. In only two years, Mathis has accomplished a lot more than a lot of players do in four years. His talent impressed the likes of SEC powerhouses such as LSU and Alabama. Like predicted, it came down to two schools at the end. Phidarian Mathis picked Alabama in the end on National Signing Day. Now, Alabama is getting themselves another great defensive lineman from this state. Expect Phidarian Mathis to be just as successful as the others who went through the Alabama Crimson Tide program under Nick Saban. Our very own Alex Martin caught up with the Neville DT and Alabama signee to go over his decision to pick the Crimson Tide, playing at Neville, and so much more in today’s recruit spotlight! I haven’t maxed out at anything yet. LAFM: What are your stats and accomplishments while at Neville? This year, I had 50 tackles and seven sacks. I also made 1st Team LFCA All-State, LSWA All-State, All-Northeast, All-Ouachita, and 2-4A defensive lineman of the year. LAFM: What are your strengths as a defensive lineman? My strengths are pursuing to the football and stopping the run. LAFM: What are some things you need to improve on? I want to improve on my speed as well as working on new moves. LAFM: What college or NFL player so you model your game after? I model my game after Marcus Stroud (former Georgia Bulldog and NFL defensive tackle). LAFM: You have signed with Alabama on National Signing Day. What is it about the Crimson Tide that attracts you to play football there? I love Alabama. It’s a great place. I love the coaching staff and the players, I know that I will get a good education there. LAFM: What was your favorite game that you have played while at Neville? My favorite game would be playing against Warren Easton to go to the state championship. I would want to say stay humble, do what’s best for you, and chase your dreams. I haven’t figured out my major just yet. I really don’t have a pregame routine. I just bounce around. Baked chicken and rice is my favorite pre-game meal. LAFM: Who is your favorite music artist you like to listen to before each game? PNutt tha Yunginn is my favorite artist. LAFM: Are there any other sports that you play when the football season is over? No. I don’t play any other sports after football season. LAFM: Is there anybody in your family that has played high school, college, or even the NFL? No sir, not that I know of. Hopefully, I will be the first. I would like to thank the Neville nation,the teaching staff, every last one of my coaches, my parents, and last, but not the least, the good Lord. LAFM: What makes you unique from other defensive linemen in the state? What makes me unique is my motor. I love to run, and I set goals for my self everyday. I am a very humble player that is not selfish.